At some point in every computer owner’s life, the machine they have come to rely on to check the news, stay in touch and work on, stops working. This can be due to any number of factors, such as viruses, errors and hardware failures. When such a situation arises, if you are not prepared to deal with it, it can lead to a sticky situation. You can lose everything on your hard drive, render your system inoperable or be forced to re-install everything on your PC. When you first buy a new computer with Windows 7 on it, you should take the time to create a system repair disc. 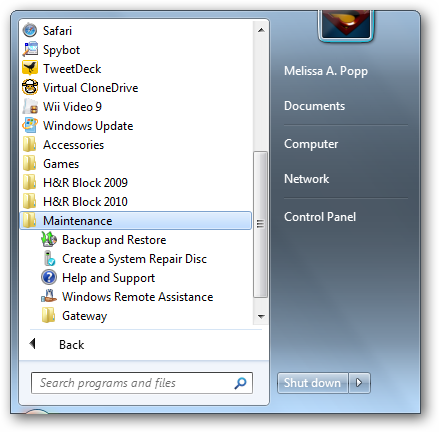 A Windows 7 system repair disc has all the tools necessary to repair, recover and reinstall your operating system in the event that a catastrophic failure occurs. These discs do not come standard with new computer purchases anymore, so you must make one yourself in order to take advantage of it if your system crashes. 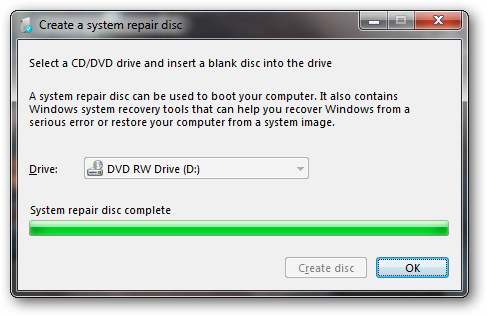 Making a system repair disc is easy to do and takes just a few minutes from start to finish. When you decide to make a Windows 7 system repair disc, you need either a CD or DVD to burn it to. 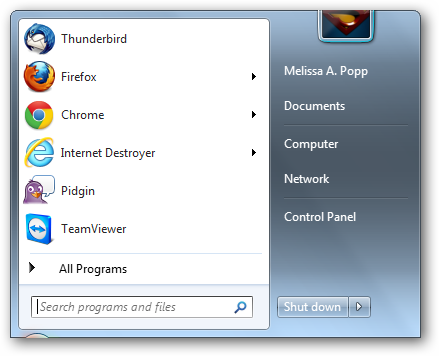 You can use either form of media, and if your computer requires one or the other it will tell you when the process begins. Most system repair discs can be burned to a single CD though. Once you have your CD, you can begin the process. There are two ways to get to where you need to go to make a repair disc. Click on the link that says “Create a System Repair Disc” to open up the disc creation tool. Look under the “System and Security” header. Click on the “Back up your computer” link. 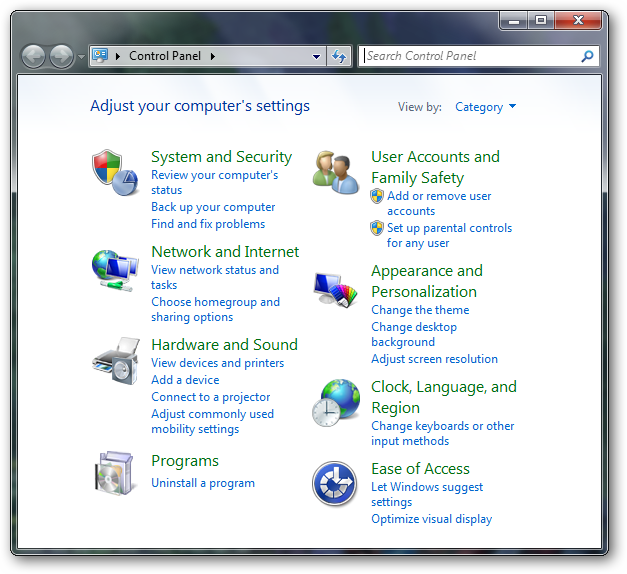 In the left hand pane, you will see an option for “Create a System Repair Disc.” Click on it. Now you can begin to create your repair disc. The next screen will let you know your operating system is prepping the disc. This will take just a few seconds. Then, it will begin creating the disc for you. This could take a few minutes and up to 15 or 20 minutes depending on what else you are doing at the time. Once finished, it will alert you to it. Click “Ok” to complete the process. A screen will pop up the first time you make a system repair disc to let you know how to label the disc for future reference. 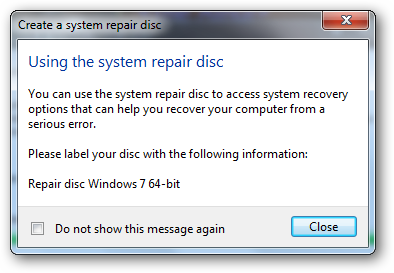 In the disc I made for my own operating system, it is telling me to label it as “Repair disc Windows 7 64-bit.” Make sure as soon as the disc is done, you label it and put it away in a place you will remember. Do not wait to label it as you may forget what it is down the line. 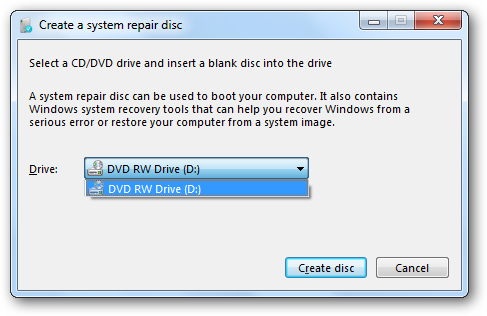 Conclusion – Why is it important to make a Windows 7 repair disc? 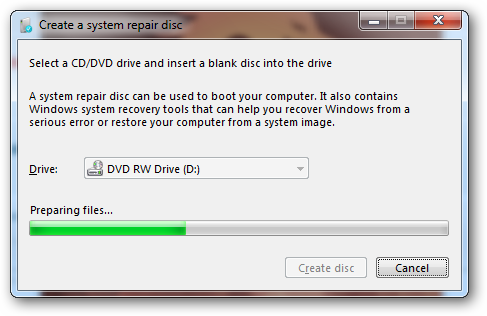 When you first buy a computer, making a Windows 7 repair disc should be one of the first things you do. Having this disc handy can help out in any situation where you may need to recover your system. If you do not have a repair or restore disc, you may have to buy one from the manufacturer and wait for it to ship to you before you can restore your system. 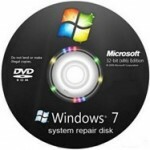 Making a Windows 7 repair disc allows you to take care of any issue from the get go instead of waiting it out if something should go wrong with your operating system.